Police are continuing to investigate the murder of a man in Dubai. Rohit Jagada, an Indian expat, was a popular businessman and his death has shocked people who knew him. Officers have conducted interviews with a number of people, including members of his family, as part of the investigation, and told 7DAYS that this was routine. Jagada worked at Prince Audio Visuals in Al Quoz and was a member of the Haven Fire football team in the Dubai Amateur League. He was described by teammates as a “lovely man”. The team held a minute’s silence in his memory before their match on Monday. This entry was posted on February 4, 2009 at 23:12	and is filed under Dubai. 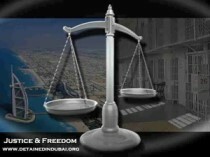 Tagged: Dubai, Dubai Courts and Police. You can follow any responses to this entry through the RSS 2.0 feed. Both comments and pings are currently closed. Thanks a lot to all of you ( neighbours and classmates from Kuwait, ex-classmates from US and Manipal, Work colleagues at Nortel, Friends from Mumbai and Blore ) for the kind words and support extended towards Rohit and the family during these trying times. It is really sad to know the death of our classmate. We studied together in manipal. He was very nice,friendly person. I have never seen him having any kind of arguement or issues with anybody. I pray to god to give strength to his family members to overcome this tragedy. Punit was and is, still a very good friend. I knew Rohit when he was a little boy,always running around and following wherever Punit went.This news is so tragic that we all wish it were untrue. Punit..No one can ever even come close to understanding what you and your family are going through right now. We also cannot begin to even feel what you and your family are feeling now. Please take heart ‘cos you have so many friends who love you and your family. Rohit is with God now. May God give you strength, as you go through these terrible times.May He also give you all courage to live and carry on with your lives. Also i convey our deepest condolences to Dipti and uncle and aunty. Rohit was defintely one of the finest persons around. His death is shocking and its time for all of us to reflect. Fell really bad for his family – hope they will be able to come to terms with his demise soon. Rohit – Happy Valentine’s Day. You are in a better place than all of us. I owe all of what I am today to Rohit,Ive lived with him for 4 years in India and on and off in the US. I don’t think i will meet a finer person in my lifetime. God bless his soul and fix the person who did this. Unfortunately, it is the same Rohit. They were my neighbors too. There was this Rohit I knww (my neighbour) that lived in Kuwait back in the 80’s. He had an older brother Puneet and a sis Dipti….are we talking about the same person? Is so..this is crazy! Can someone kindly confirm? Rohit was cremated today. Sad. Hope that family will braze these tough times with patience and prayers. May Rohit rest in peace. Rohit was truly a jolly good fellow. I know people normally say good things about someone when they have departed, but in the case of Rohit, this is true. I will miss you buddy. We hope your family will eventually get on without you beiong around. Gold bless Rohit’s soul. God help his family. May the murderers be punished severely.